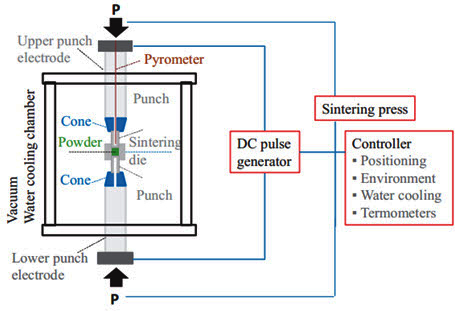 Pulsed Electric Current Sintering is a relatively new technique which in essence is process which can create near full density contacts at relatively low temperatures. The main advantages of PECS is that because of these minimal thermal conditions the microstructure of the material is preserved with minimal grain growth. Pulsed electric current sintering (PECS) also known as spark plasma sintering (SPS) or field assisted sintering (FAST) is a relatively new innovative technique for the consolidation of fine or nanocrystalline powders and has received much attention in the recent years because of its many advantages compared with other sintering/bonding methods such as the hot pressing and hot isostatic pressing (HIP) processes. According to Tokita, the history of the technology, related to the process in question, started in the 1930s in the USA where the first resistance heating method was patented. On the other hand, SPS was originally invented in Japan in 1962 as ‘spark sintering’ according to Inoue. However, the technology was commercialized in the late 1980s, and various companies started to manufacture SPS equipment based on the original technique. Several different materials and material combinations are suitable for PECS, e.g. metals, metal composites, oxides, nitrates, carbides, and polymers are widely produced. The method is getting more publicity when producing functionally graded materials (FGM), intermetallic compounds, semiconductors, ferroelectric materials, electroceramics, fiber reinforced materials, laminates as well as nanocrystalline materials and -composites. Also produced by PECS, to some extent, are transparent materials, porous materials, amorphous alloys, shape memory alloys and superconductors. This method has also been shown to be suitable for other materials, which are difficult to prepare conventionally. As mentioned above the pulsed electric current sintering (PECS) is a relatively new technique that can produce nearly full density compacts in short times and lower temperatures, which can keep grain growth to a minimum. Direct current can be constant or pulsing, typically below 1000 A, with low applied voltages, normally below 25 V. Chamber atmosphere, typically inert gas such as Ar, can be varied to reduce corrosion during sintering; H is used to reduce oxides on the powders surfaces.88 Graphite is mainly used for dies and punches due to its tolerance of rapid heating, but ceramics or steels can also be used. Applied pressures during PECS are typically below 100 MPa, due to the mechanical strength of the graphite used. The combination of the electric current and the applied pressure can drastically reduce the time and temperature needed to sinter many materials systems. Reduction in sintering time compared to hot pressing or hot isostatic pressing is seen in Si3N4, Al2O3-Y3Al5O12, Fe0.91Mn0.09Si2, Si2N2O3-CaO-Al2O3, Y2O3-ZrO2-ZrB2, Cr2AlC, and hydroxyapatite powder. Lower sintering temperatures have also been observed in Si3N4, Al2O3-Y3Al5O12, Si2N2O3-CaO-Al2O3, Y2O3-ZrO2-ZrB2, ZrB2-MoSi2, and Nb/Nb5Si3. Additionally, compared to hot pressing or hot isostatic pressing, PECS can provide finer microstructures, more homogeneous microstructure, higher density, higher densification rate, improved mechanical properties improved electrical properties, and improved bioactivity. The improved properties seen when PECS is used make it an ideal processing route for the production of new materials for KEPs. It must also be pointed out that in the PECS process, a pulse of electric current flows directly through the sintered/bonded materials, yielding a very high heating efficiency. In general, a heating rate up to 1500°C/min can be achieved using the PECS process, compared with 50-80°C/min for the conventional sintering/bonding process. In the PECS process, the heating rate is an important factor. It affects the properties of the sintered/bonded specimens. As concluded in the paper of A.Wang and O.Ohashi for the same bonding temperature, the mesh temperature under rapid heating was higher than with slow heating. Strong bonding can be achieved by rapid heating due to the concentration of heat at and near the mesh the deformation of the rod was reduced.